Winter Warmth Heater Under Desk Mat for personal comfort. The Heated mat is 2x3 feet in size and runs on standard household 120 AC Voltage for easy operation. The mat comes with a 6 foot cord with integral GFCI. The mat can be plugged into a standard 120 volt, 15 amp receptacle. The Winter Wamth mat is a safer and lower cost alternative to plug in electric space heaters. 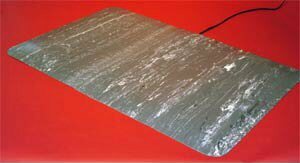 The Winter Warmth mat is in a grey marble finish with an overall thickness of 1/2 inch consisting of 3/8 foam and 1/8 inch vinyl finish and beveled edge. The Winer Warmth mat reduces fatigue from sitting and creates a warm environment for productive working. The Winter Warmth Heated mat is made in the USA.